Hey everyone! Just a quick post before my "real" one. ;) Disneystore.com's "Twice Upon a Year" sale is going strong, and today's promotion is 50% off of select toys and plush. This does not include the DAC classic Dolls (which seem to have been restocked...good news for those of you who were wanting to continue your collection! ), but it does include the special edition DAC Cinderella. She's down to $24.99! The sale also includes a few of the Singing Princess dolls, some of the classic 12" Princess dolls, quite a few of the plush dolls and characters, several of the newer Cinderella items and more. You can see all of the items for sale HERE. Today we woke up to a wonderful surprise: snow!! A few shots of our transformed backyard. Jenna and Hayden enjoy the view. The snow kept falling in huge flakes for a good hour or so. It was so fun to see the world slowly turn whiter and whiter. Of course, my daughters were super excited to go out and play. They brought out their dolls for a few photos, too. I couldn't get over how beautiful all of the plants and trees looked under a fine dusting of snow. 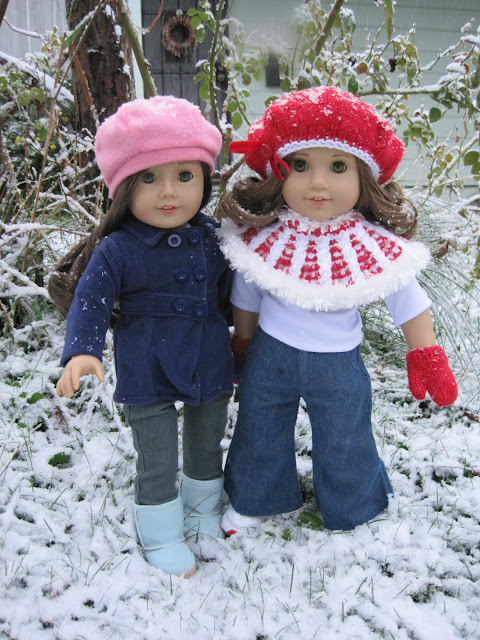 The girls soon got serious about playing in the snow and left their dolls in the safety of the little back porch, under the eaves. Middle Gal made this cute baby snowman. Oldest Gal made a bigger snowman out on the lawn. I'd like to end this post with a thank you to all of you who have been praying for me and my family. This month has been tough in a lot of ways, but it's also been a great opportunity to see the Lord work and provide just when we needed it most. From that unexpected rewards check from Costco I'd forgotten about that allowed us to get the groceries we needed before payday this week, to the way Hubby was able to negotiate with Charter on a better deal so that we don't have to cancel our Internet (yay!!! ), I've seen Him at work in the little things. I'm so thankful for a God Who cares about the seemingly insignificant things in our lives. This is not going to be a quick fix, and we're going to have to remain disciplined, especially these next few months, in order to keep on course. But God is good. We have our home, a special Christmas to look forward to with our families, and 3 beautiful girls. In light of the horrific events of the past week in Newtown, Connecticut, I am reminded more and more of how brief, precious, and unpredictable life is. We need to live each moment to its fullest. I need to remember how quickly these years with my children will pass by when I'm tempted to answer them unkindly or impatiently. My heart aches for the parents who lost their sweet little ones last week and will now have to face Christmas without them. My thoughts and prayers are with them, as I'm sure yours are too. New Fantasyland in Walt Disney World is Open! Okay, I know I already posted this morning, but when I got an email about the new Fantasyland opening in Walt Disney World, I just had to post and spread the excitement. First, a video clip of the grand opening, featuring several Disney characters, and Ginnifer Goodwin, who plays Snow White in the ABC show "Once Upon a Time". Click HERE to see the video. If I ever get to go, I'll be visiting Maurice's Cottage, the Beast's Castle, and the village square near Gaston's Tavern. I think it would be fun to see Prince Eric's castle, too. After some further digging, I found these amazing YouTube videos that give a closer look at some of the Beauty and the Beast attractions. So, anyone else interested in paying a visit to Walt Disney World? Hey guys! Just wanted to let you know about more sales at Disneystore.com for that last-minute shopping. Take an extra 20% off of select sale items. Apply code BONUS20. There are dolls, plushies, clothing, accessories and more included in this promotion. You can see all of the items HERE. One last thing. Due to numerous requests, I decided to take word verification off of my comments. However, I've since been bombarded with 20 to 30 spam comments per day, and it's just getting to the point where it's not worth it anymore. I do understand your frustration with word verification. Now that they've added fuzzy photos of numbers to the jumble of letters, it's very difficult to tell what you're supposed to type. I get frustrated with it myself. But I'm also getting frustrated with all of the spam comments I'm getting (some of which has been extremely inappropriate). I hope you all understand my decision. I realize that some of you may not comment as frequently because of this, and that's okay. I've just got to make this site as low maintenance as possible. Talk to all of you again soon. And speaking of eBay, I've now had two instances where someone has used one of my photos of my dolls for their doll they have for sale. Please, if you want to use one of my photos, ask permission first, or at least link back to my blog and give photo credit. I think it's unwise to use a photo of another doll anyway. As someone who purchases dolls on eBay, I always prefer to have a photo of the actual doll I'm purchasing. I feel it is misleading when the seller uses a photo of another doll unless they state specifically in the auction that the doll pictured is not the actual one they are selling. Okay, off of my soap box now. Just please, please ask permission before using my photos. I may have to start watermarking them to avoid this scenario, which is a total pain (another step before uploading photos to blog posts...sigh), but may be worth it if this continues to happen. This week has been a little rough. Aside from the fact that fevers and coughing have spread through our house like wildfire and I'm beginning to feel a bit like Florence Nightingale, we're also going through a rough bit financially right now. Call it a combination of unexpected expenses, a shortage of working hours for Hubby, and being behind on a bill or two...or whatever you like. The point is, things have to change around here. Hubby and I took a good look at our finances and realized in order to continue to send our girls to our local Christian school and to get out of debt as we'd like to, we need to make some sacrifices. Even with those, it's possible that Hubby may have to take up a third job. This is a scenario I'd love to avoid if at all possible, but we may not be able to get around it. All this to say that there will be a few things I will have to do differently in the blogging world, too. For one thing, there may be less reviews after a while. For now, I still have several reviews that are in draft, so they won't disappear completely at first. Once those run out, though, I'm going to have to focus more on doll photography and perhaps a thrift store haul every once in a while. Spending on extras like dolls and doll accessories is going to have to be limited to the bare minimum until further notice. I also may not be on Blogger quite as frequently after this week. We've had a wonderful deal on our Internet for the last 2 years, but that deal is up, which means a $20 price increase per month. We've made the decision to try going without Internet for a while, just until we can catch up a bit. This doesn't mean I'll disappear completely. I'll be able to check my Internet and do my blogging from my parents' house. I just may not be able to respond to comments or emails as quickly as I usually do. Please be patient with me as I figure all of this out and find my new routine. Another change you might notice is that I'm going to have to downsize my collections a bit. I've come to realize that I've been rather selfish in my collecting. It's been all about me, when my first priority should be my family. I've never blown $100 on a doll without telling anyone, but I have spent a little here and a little there until suddenly, I've spent $100 over the course of a month or two. I've really got to work on this. I know I had a post about this at the beginning of this year, and I was really good for a while before slipping back into the old habits again. This time around, I hope to stick to it like I should. In January, I will most likely be listing some of my dolls on eBay. I'm hoping to start with some of them that I haven't bonded with as much at first. And don't worry. Tess, Maggie, Belle, Emma, and most of the regulars will be sticking around. However, my LIV dolls, Moxie Teenz, and some of my Beauty and the Beast dolls will most likely be on the chopping block. I will also most likely have to part with my Jess doll. It makes the most sense...I haven't had a chance to develop her story yet, and she was an extra purchase that I didn't need. I'd rather part with her than one of my established dolls. I'll keep you guys posted on our progress. Okay, I guess that's about all for now. Sorry this post isn't as happy and uplifting as my posts normally are. Just wanted to make you aware of some of the changes. I don't foresee us having to continue on in such a drastic manner forever. We just need to get down to the "bare necessities" (brownie points for a random Disney reference) for a while until we can get a little more financially stable. Friday morning, my aunt and I started off for Nevada, where one of my very dearest friends lives. I haven't had a chance to see her house yet, and there's a big possibility she'll be moving in the next few months, so I wanted to take this chance to see her before she moved farther away. We had beautiful weather for our trip, and the scenery was lovely. Of course, one of the things I looked forward to was visiting the local Disney Store. :) I didn't get as many pics this time because I didn't get around to asking permission first (which I prefer to do). We were also there with my friend's two little girls and I didn't want to take too much time getting photos and making everyone wait. One of the Cinderella displays. After the mall and a few other stops, we enjoyed a delicious lunch at BJ's. Mimi and I don't have one of these restaurants in our area, so we enjoyed trying something new. We had to wait for about 30 minutes before a table was ready, so I entertained myself with taking random pictures of the building and the beautiful sky, watching the people going by, and enjoying the chatter and antics of my friend's daughters. After lunch, we headed over to a store called "Scheels", which Mimi and I had never heard of. It's pretty much the ultimate sporting goods store with a lot of other little shops thrown in. It had this really cool aquarium in the entrance that you could walk under. Not to mention a really cool display of different animals from the area. The back of the store led to some other outlets. There were lots of these really nifty statues and sculptures on display beside the stores. Here's a tower, complete with airplanes. The beauty of these sculptures was amazing. One last view of Scheels' aquarium. At the Sanrio Store, Mimi got a surprise grab bag. It had a fancy Hello Kitty cell phone charm, some stickers, a set of 3 lollipops, a journal, a marker, and a plastic holder to store the journal and marker. I brought a little bit of spending money along and found a few fun things to take home as a memento of my trip. At the Disney Store, their reusable shopping bags were on sale for 2 for $5. Mimi got a Minnie Mouse one, and I picked up this "Wreck-it Ralph" bag. Here's the other side, with the full picture. The narrower sides look like this. But don't despair: I didn't leave completely Princess-less. ;) The mini plushies were on sale for $6 each, so I decided to bring a mini Belle back home with me. I had originally intended to get a mini Rapunzel (I've been a fan of those since my trip to LA in July), but there was only one Rapunzel left and she had kind of a wonky face. Belle was a good substitute. This is probably the first mini plush Belle I've seen with a face I actually like. I decided to try her out with a couple of my Beast stuffies. She's a little big for this one, but it works. And she's slightly small for this one, but again, it works. I found these two super cute cell phone charms in the clearance section (with the help of a sales associate). I've been looking all over for a My Melody charm to go with the Chococat charm I found for Jenna's necklace. This one is perfect! Here's how the My Melody charm looks with the rest of Jenna's necklace. Whenever I see these characters, it brings me back to the wonderful times I had with my Japanese exchange students growing up. :) I'll definitely have to find a special spot for this poster. Okay, true confessions here: I've become a HUGE fan of My Little Pony: Friendship is Magic. I let my girls watch a few episodes, but not a lot of them. There are too many episodes that are either too scary, too full of ponies yelling at each other, or have a little too much of an emphasis on magic or spells than I'm comfortable with for my kiddos. I just love the show for ME. So many of the characters remind me of myself or my friends from high school. Plus, it's a children's show that's almost more fun for the parents than for the kids. ;) The writing is great, the voice work is amazing, and the songs are fun and catchy. Plus, the ponies actually have personalities, flaws, etc...and aren't just sitting down at a tea party being all nice to each other in that syrupy sweet way. As you can see, she's not quite the right scale for the other Blind Bag ponies. A comparison of the two together. Scootaloo, Apple Bloom, and Sweetie Belle, the "Cutie Mark Crusaders"
The "Mane 6": Twilight Sparkle, Fluttershy, Applejack, Rainbow Dash, Rarity, and Pinkie Pie. Mimi can attest to the fact that I searched high and low for a Rainbow Dash 4" pony to go with my slowly growing collection (so far, I have Twilight Sparkle, Fluttershy, Applejack, and Lily Blossom...all but Twilight Sparkle were Goodwill finds for 49 cents each!). Sadly, there were no Rainbow Dashes to be had anywhere. Then, of all things, my mom found one right here in my hometown at Walmart yesterday. She brought it to me as a surprise, which was a nice end to a rough day. More on that story and more on my ponies in a later post, though. I could hardly believe it! She was exactly like she is pictured above, dressed in her green velvet Christmas dress with her socks, shoes, and her bloomers (although the elastic is worn out). She was...get this...$2.99!!! Molly does have some condition issues. Her legs and arms are really loose and will need to be restrung. Her lip color seems to have faded completely. Her skin was pretty filthy too, but everything came up really nicely with a Magic Eraser. Her hair was in surprisingly good shape. I don't think she's been played with very much. Hubby and I are giving Oldest Gal a used AG Elizabeth doll for Christmas this year. She was a Craiglist purchase that we've had since last year. Originally, my plan was to give each of the girls a doll on their 8th birthday, since that was the year they were officially within the target age for American Girl. However, when Oldest Gal's birthday came around, the timing just wasn't right, so we decided to do it on her 8th Christmas instead (well, technically her 9th, but you know what I mean).